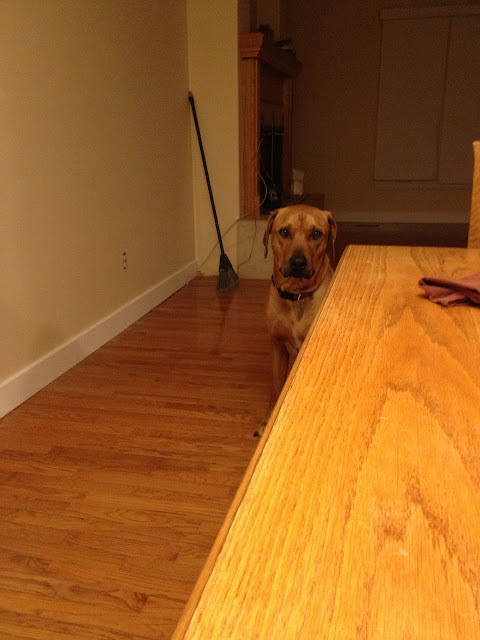 This morning my routine was disrupted by a whining Ridgeback. I pulled the sliding glass door back and forth several times but Max didn't seem to want to go out. I'd fed him and there was lots of water in his dish. I tried the "Lassie Routine" - asked him if Timmy was in the well and walked past him to see if he'd lead me to discover Pitou in need of help. He watched me walk away, a piteous look on his face. I think he was upset because his routine was disrupted this morning. Max usually lies on the couch for a bit after breakfast, as does Pitou. Our living room and dining room furniture is now in the kitchen as we're getting a light re-finish of the hardwood floor today. It seems the dogs are not happy with that arrangement. As soon as I put something a little more comfortable on the floor, Max took up his usual spot. He still looks a bit worried though. Oh how I do love music. It's been a part of my life since before I was born when my Mom sang in the church choir with me listening intently from within. It relaxes me, cheers me, calms me, saddens me, uplifts me, makes me work harder on the eliptical, makes walking up the ridge incredibly easy and thanks to headphones makes grocery shopping bearable. This week I'm very grateful for being surrounded by music in it's many forms. I'm grateful for the variety of music I get exposed to on CBC radio everyday. Thanks to shows like Q, Canada Live, Radio West and Daybreak South, I can hear hip hop, folk, country, classical, jazz, pop, opera, indigenous music and lots of indie and local bands you don't hear on the local top 40 and Classic Rock stations. My little Pitou is such a trouper. He's a determined little guy who won't let a little snow keep him from chasing his big little brother. We really enjoyed the Mission Ridge yesterday afternoon and I'm about to head out and enjoy it with a little sunshine today. The only way I can find to make the vide bigger is to go to your menu at the top of your desktop and select "view", "zoom in" - on a Mac the short cut is "Command" and "+". Not sure about PC's. This Monday I'm feeling very grateful for the kind, generous, thoughtful, creative, people who are a part of my life. 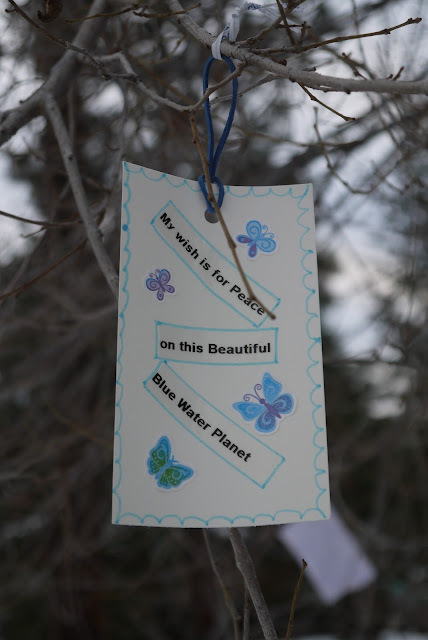 I'm grateful for all of those who have contributed to the wishing tree. It's really taken on a life of it's own. Last week I put out a thank you note accompanied by a gift bag of Hersey's kisses, with an encouragement to "share these small tokens of thanks with your neighbours." When I pulled into the driveway on the weekend I thought someone had taken the bag. On closer inspection the gift bag had been placed inside a clear plastic bag so you could still see the note. Inside the bag I found a collection of polished rocks, smooth and round on one side, and on the other, flat with the engraving you see in the photo. I have no idea who put them there. We've been blessed with sunshine for four of the last five days. The local weather forecast is not looking as bright for the rest of this week so I thought I'd post some of the shots I took on Friday when Pitou and I stopped for some Vitamin D at Rotary Beach. I'm very pleased with the quality of the photos on my new 4S iPhone. I've been writing, writing, writing this week. Mostly transcribing the conversations that Reg and I had this past September. I can't wait to get these stories into the memoir. Anyone who blogs knows how time consuming it is so I'm going to cheat a little today. We're still early enough in the year to do a top ten list aren't we? I thought ten might be a bit much so I took some inspiration from Lilly's blog Feel LOVD Everyday and listed five of my favourite posts from January to November 2012. I left out December since you probably looked at them recently. The wishing tree is probably the true Number 1 in terms of the number of visitors. I really enjoy the snow. I grew up in a part of the world where the first snowfall was usually around Hallowe'en, and there was still ice on the lake in May. I have extremely fond memories of my childhood/early teen winters. Early in December I followed the instructions on Day 8 of the Acts of Kindness Advent Calendar and made a Wishing Tree in a corner of my front yard. It might surprise you, but I gave it some serious thought before I did it. In the past, doing things that are outside the mainstream have brought me mocking comments or eye rolling from some of the people I know. Then there was the fact that in the past our car had been vandalized with an obscenity, requiring a new paint job. Some of the moonlights in the front yard had been stolen or broken, and there are a few fences and stop signs in the neighbourhood with graffiti on them. I was concerned that I'd be constantly replacing stolen pens and markers and that some people would write rude comments on the wish tags, or use the markers for more graffiti.